Gen7 R2 integrates with leading Service desks and Change Management solutions to reconcile the changes that are actually occurring within your environment with those that were expected and part of an approved Request for Change. Security and IT Service Management (ITSM) have traditionally observed and managed change in two very different ways. By linking the changes approved and expected within the ITSM world with those that are actually happening from a security perspective, SecureOps™ is delivered and underpins effective, ongoing security and operational availability. Independent research has indicated that 91% of ALL security breaches can be auto-detected by utilizing tools, techniques and detective controls included in Gen7 R2. 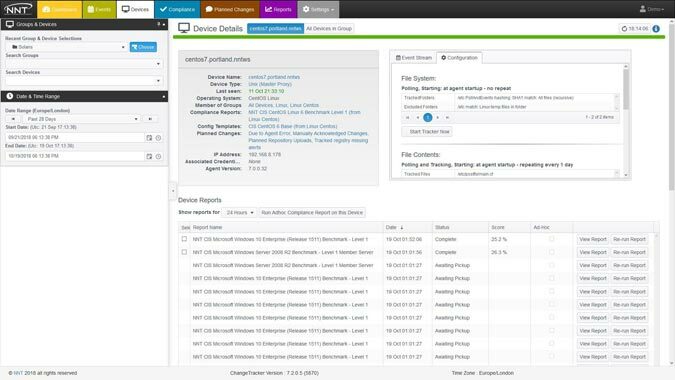 Ensure all IT assets are secure and breach free at all times by leveraging state of the art, recommended security and configuration hardening settings along with real-time system vulnerability and configuration drift management. Change Tracker™ Gen7 R2 identifies suspicious activity using highly sophisticated contextual change control underpinned by threat intelligence to spot breach activity while reducing change noise. 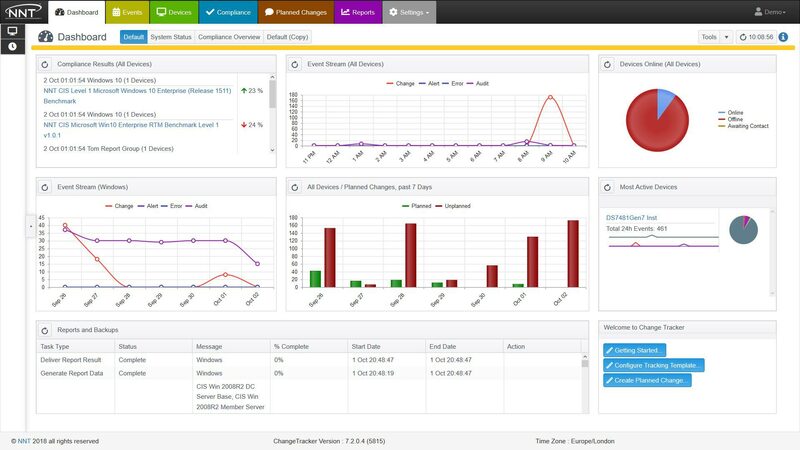 By creating a secure and compliant state for all IT systems and combining that with ongoing, context-based change control plus baseline management, Change Tracker™ Gen7 R2 ensures systems remain in a secure and compliant state at all times. Gen7 R2 has the ability to reduce change noise by more than 90% leaving only changes that are unknown, unwanted, unexpected or malicious in nature. New ‘FAST list’ planned change rule option, ensures only file changes you select as permitted, allows a user-defined list of approved file changes to be operated – like a personal FAST Cloud! Noise Reduction through Integration & Automation - Unique ability to differentiate expected vs unexpected changes that increases an organizations security posture while minimizing the risk of operational downtime. Digital DNA Reference - NNT’s FAST Cloud is the world’s largest database of known and trusted files and applications (whitelist). Scalability - Devices supported under a single console is unlimited. 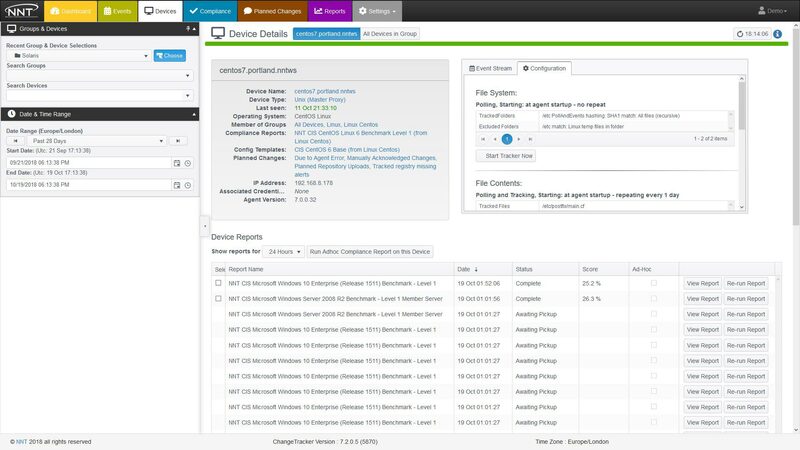 Manageability - A single console managing countless platforms with intuitive policy management that simplifies an organizations ability to mitigate security risk while increasing operational availability. In the first instance, Change Tracker™ enables an organization to bring IT systems into compliance with a 'known good and secure' state using 'out of the box' or user-definable vulnerability and build-standard auditing policies. 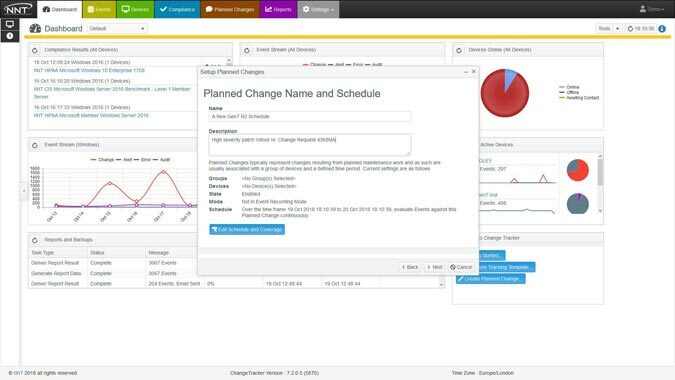 Once IT systems are considered to be within compliance of your required hardened build standard, as well as configured and set up properly, Change Tracker™ then uses non-stop, continuous configuration auditing and change tracking to ensure they remain that way. If something does change, Change Tracker™ will immediately report what changed, when, by whom and crucially, whether that change was part of a Planned Change. 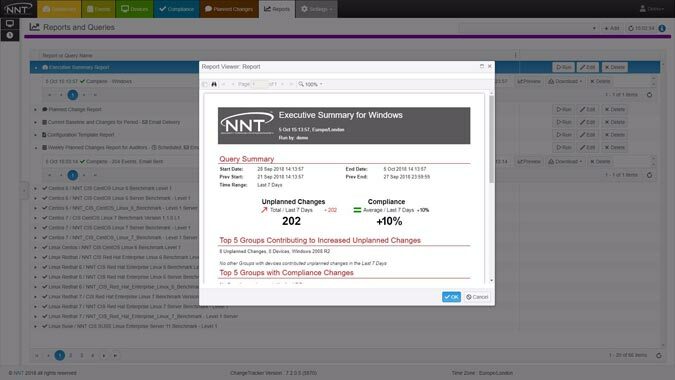 Dynamic Compliance Dashboards also provide 'at a glance' reassurance of your continued safe and compliant state. NO WONDER SECURE COMPUTING MAGAZINE RECENTLY AWARDED NNT CHANGE TRACKER THEIR HIGHEST AWARD OF 5 STARS FOR ‘FEATURES, PERFORMANCE, SUPPORT AND VALUE FOR MONEY’. NNT Change Tracker - 5 Star Review from Secure Computing. This product packs quite a bit of features and functionality for a low cost. SC Magazine. Written by: SC Magazine.